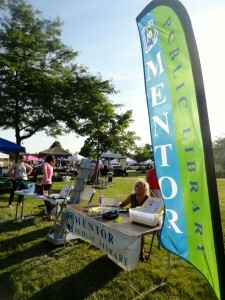 A Flash Library at the City of Mentor’s Farmers Market. In a perfect world, nobody would live more than a block from the library. Every person—child, teen or adult—could come to the library on a whim. However, we live in a world of finite resources, and it would be impossible for us to build a branch on every block. So we try to do the next best thing and bring the library to you. We do it in a lot of ways: our digital services that let you download eBooks, stream video and music, or download mp3s from home; our little free libraries; Beach Reads. And our Flash Libraries are going to be springing up at parks, cul-de-sacs and farmers’ markets this summer. 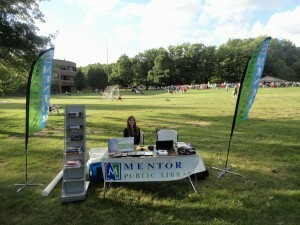 We have already brought our Flash Library to Lake Metroparks Veterans Park and you’ll likely see us there again soon. We’re also bringing our Flash Library to the city of Mentor’s Final Fridays, Headlands BeachFest on July 26 and Concord Community Days on Aug. 16. Where else do you want to see our Flash Library? How can we help bring Mentor Library to you? A Flash Library during the city’s concert series at Civic Center Park. This entry was posted in Uncategorized and tagged BeachFest, Concord Community Days, Flash Library, Lake Metroparks, Veterans Park. Bookmark the permalink.